You ever watch those movie trailers, posters or commericials which start off by saying “since the dawn of time…”? I find them cheesy too, dear readers. But I want to try it out one time okay? 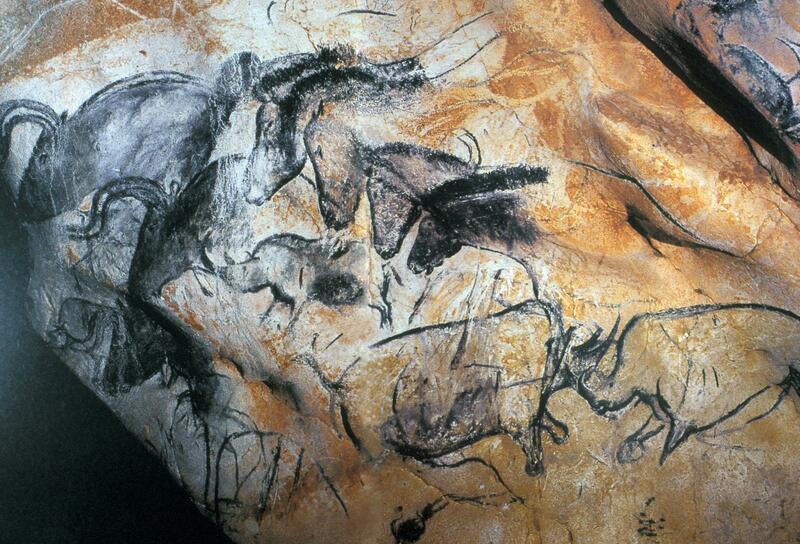 Since the dawn of time, mankind has created artwork and stored it in precious places. In other words, for what seems like forever. You know, FOR-EV-ER? Eternity? Infinity? Time without end? Even you can comprehend THAT Gollum. You don’t believe me, well that’s fine. I love pulling out my art history cap every now and again. Just give me a minute here to get down to business and find some images and links to get this party started. This image was one of the first cave painting images I ever saw when I was doing my undergrad, at the time it was considered to be one of the oldest images ever made (approx. 32,000BC – 30,000BC). According to this article, a new theory has cropped up. Humans having been making art for about 42,000 years, which when taken along with the theory of evolution, means that humans have been making art for even longer than we’ve been thinking about things. Which is amazing to me, because I’ve always considered art to be a language in and of itself. That means that we need art more then we need literature and speech, it’s something that we all can understand and relate to, no matter what the oral or sign language we subscribe to. And it’s foundational to who we are. That’s right, sign language is not universal to all creeds and ethnicities. So visual language is something we can all experience and relate to, and one which is not interpreted differently in other communication styles. It’s fascinating, really. Also, while I haven’t read this academic paper on comics, linguistics and visual language, just yet – I did find an interesting point made pretty much at the start of the paper which helps with my argument. Many authors of comics have metaphorically compared their writing process to that of language. Jack “King” Kirby, celebrated as one of the most influential artists of mainstream American comics, once commented, “I’ve been writing all along and I’ve been doing it in pictures” (Kirby, 1999). Similarly, Japan’s “God of Comics” Osamu Tezuka stated, “I don’t consider them pictures …In reality I’m not drawing. I’m writing a story with a unique type of symbol” (Schodt, 1983). Recently, in his introduction to McSweeny’s (Issue 13), modern comic artist Chris Ware stated overtly that, “Comics are not a genre, but a developing language.” Furthermore, several comic authors writing about their medium have described the properties of comics like a language. Will Eisner (1985) compared gestures and graphic symbols to a visual vocabulary, a sentiment echoed by Scott McCloud (1993), who also described the properties governing the sequence of panels as its “grammar.” Meanwhile, Mort Walker (1980), the artist of Beetle Bailey, has catalogued the graphic emblems and symbols used in comics in his facetious dictionary, The Lexicon of Comicana. You see, we need visual art just as much as we need other languages and the fact that so many people discard this skill for themselves, their children, their students, and the younger generation is frightening to me. I’m generalizing here, which I hate to do, but so often I hear stories from people that made art when they were young, and then gave it up. We cannot seem to find value in learning the right skills needed to draw accurately, and attribute it to an ability which only some humans can possess. That is false and limiting behaviour. But today’s Wisdom Wednesday resource is going to get you back to your roots, so to speak. Alright, I have a secret to share with you fine folks today. Well, I wish it was a secret, because this is one of those resources anyone with an internet connection has had access to since 2011 and which I cannot believe hasn’t shown up more often in Facebook newsfeeds, on blog posts, and in cultural events. The Google Cultural Institute is an amazing achievement in digital curation and one which features artwork from around the world, archival exhibitions, and three-dimensional recreations of world heritage sites. You can navigate this content through Art Project, Historic Moments, and World Wonders, all from your main navigation menu. What I find especially cool is that you can take virtual tours of over 40 different museums, whenever you want. The search terms are incredible as well – collection, medium, event, place, person, media type, date. And did I mention the Discover feature? It lets you explore related topics at the push of a button. And of course can share your findings with friends too. But that’s not the best part. As an artist, this gets me the most excited. You can save your favourite items and create your own gallery. Now tell me that that is not cool. Ha, I don’t believe you! Tell me what you really think! Leave some comments, share some thoughts, and I’ll catch you tomorrow for something timely.